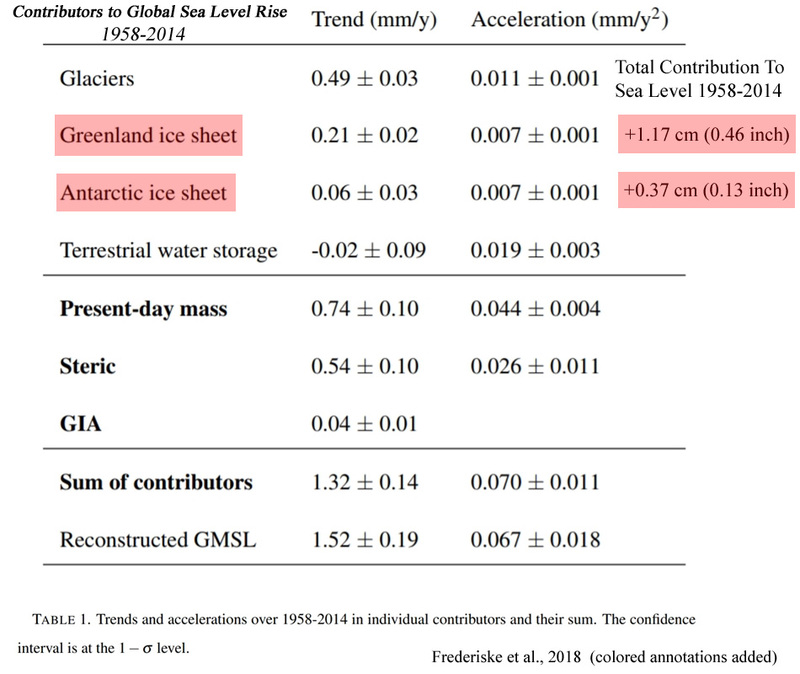 More than 70 recent scientific publications show that there is absolutely nothing unusual about the magnitude and rapidity of today’s sea level changes. These academically peer-reviewed papers show that sea levels were 2 meters higher earlier in the Holocene than they are today. 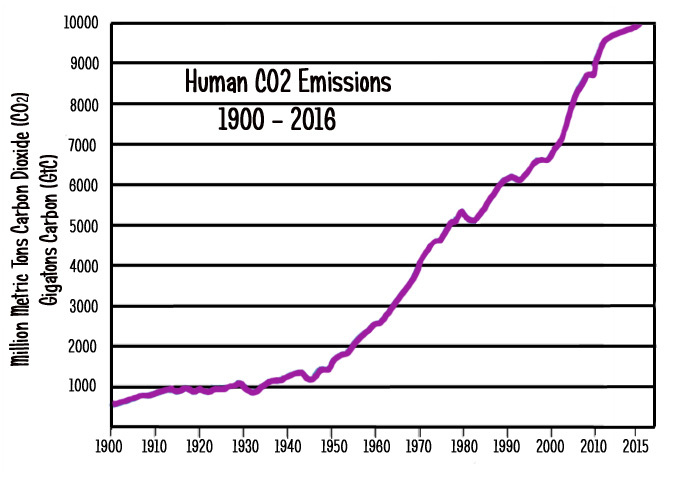 Before the advent of the industrial revolution in the late 18th to early 19th centuries, carbon dioxide (CO2) concentrations hovered between 260 to 280 parts per million (ppm). 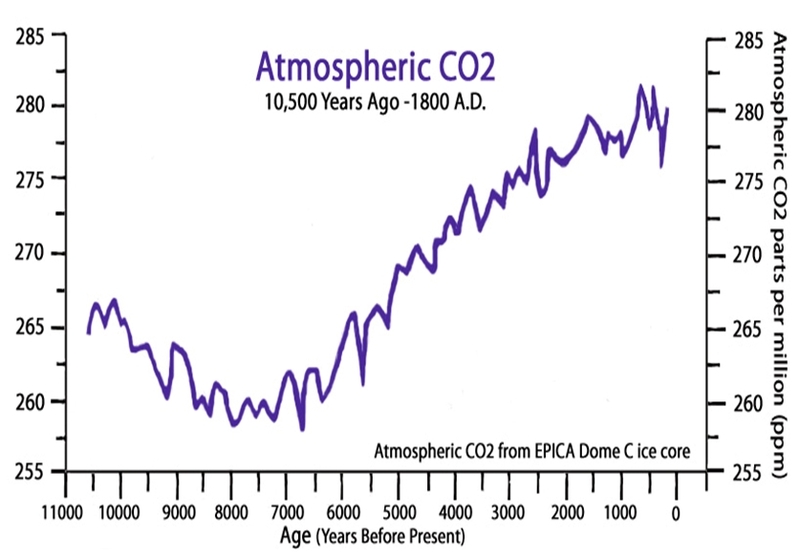 Within the last century, atmospheric CO2 concentrations have risen dramatically. Just recently they eclipsed 400 ppm. Scientists like Dr. James Hansen have concluded that pre-industrial CO2 levels were climatically ideal. Though less optimal, atmospheric CO2 concentrations up to 350 ppm have been characterized as climatically “safe”. However, CO2 concentrations above 350 ppm are thought to be dangerous to the Earth system. It is believed that such “high” concentrations could lead to rapid warming, glacier and ice sheet melt, and a harrowing sea level rise of 10 feet within 50 years. To reach those catastrophic levels (10 feet within 50 years) predicted by proponents of sea level rise alarmism, the current “anthropogenic” change rate of +0.14 of a centimeter per year (since 1958) will need to immediately explode into +6.1 centimeters per year. The likelihood of this happening is remote, especially considering Greenland and Antarctica combined only contributed a grand total of 1.54 cm since 1958 (Frederiske et al., 2018). 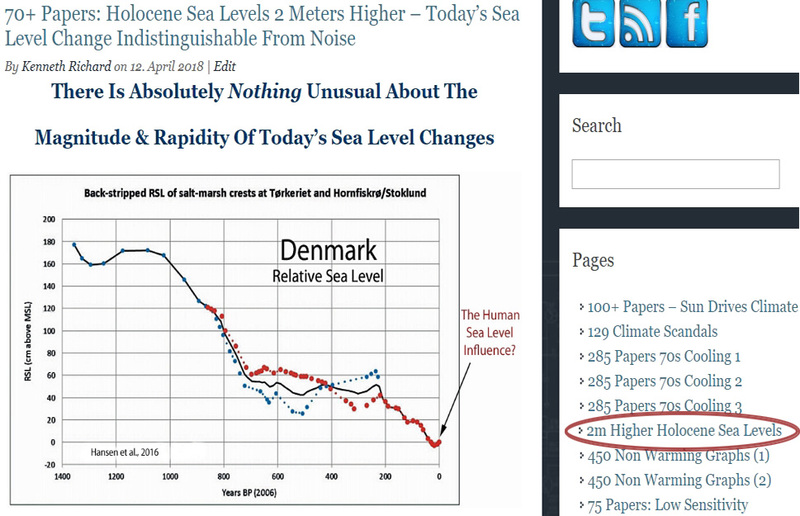 It is becoming more and more apparent that sea levels rise and fall without any obvious connection to CO2 concentrations. And if an anthropogenic signal cannot be conspicuously connected to sea level rise (as scientists have noted), then the greatest perceived existential threat promulgated by advocates of dangerous anthropogenic global warming will no longer be regarded as even worth considering. 1. Are Modern ‘Anthropogenic’ Sea Levels Rising At An Unprecedented Rate? No. During the 1958 to 2014 period, when CO2 emissions rose dramatically, a recent analysis revealed that the rate of sea level rise slowed to between 1.3 mm/yr to 1.5 mm/yr, or just 0.14 of a meter per century. 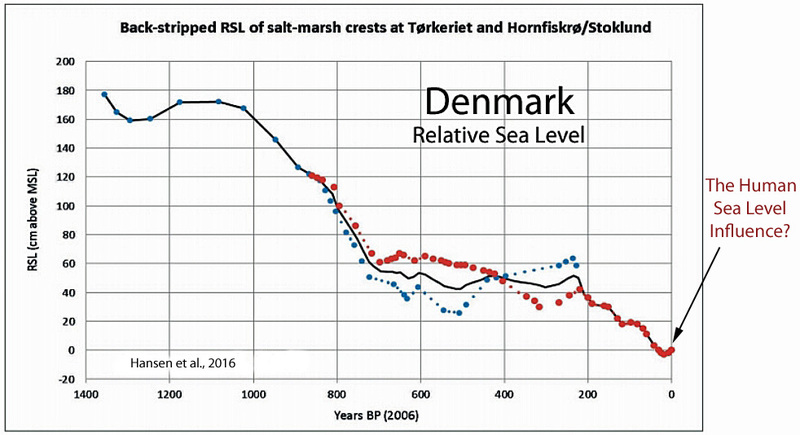 In the past few thousand years, sea levels in some regions rose and fell at rates of + or – 0.5 to 1.1 meters per century. 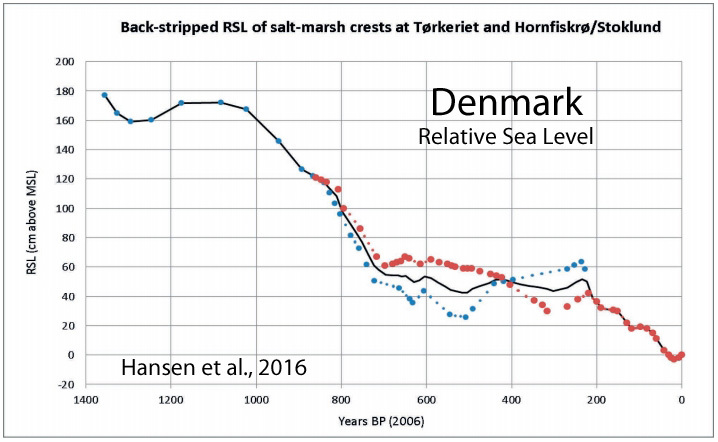 Sea levels during the Medieval Warm Period were+170 centimeters higher than today.